With an OLED screen and a body that's merely 6.5mm thick, the spec sheet of the Aiek E1 starts off nicely. It's a one-off device unlike any other that we've reviewed in recent years. Its pet-name being the Card phone, this little fellow comes in a credit-card size but don't worry, you can afford one even if you don't have a credit card. Or a wallet. Or even a roof over your head. As it's a phone that's meant to be as affordable as it gets, some compromises had to be made. For example, it doesn't run the latest Android version. Come to think of it, it doesn't run any version of any OS whatsoever, but that doesn't stop it from being the cheapest modular phone there is right now. Forget the Moto Z MotoMods - the Card phone rules modularity. Don't believe us? 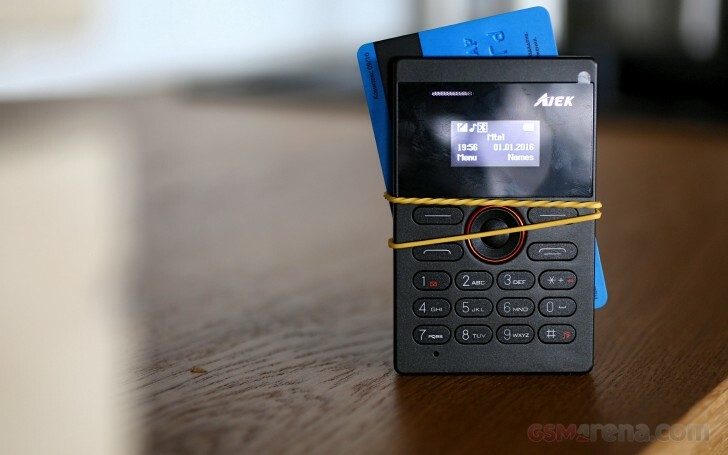 For instance, the Aiek E1 may not support Apple Pay or Android Pay or any other similar service, but that can't stop you from getting your existing contactless credit card and installing it on the phone as an add-on using nothing but Rubber Bands™. The modularity of the Card phone goes well beyond that. The possibilities are endless and they are only limited by your imagination (or the lack of it, thereof). And it costs less than $10. So how bad can it be? Join as we explore what it's capable of on the following pages. it is possible to make sms messages to this phone or only for call? Is there hotshot in this mobile and what is the cost?